Participants with Dr Dubey at the Writing-for-self workshop, 22-26 December, 2018. Are you looking to get away to a quiet place in the mountains to take time out for yourself? Being in quiet, natural surroundings is therapeutic. Add to that writing for self understanding and growth. Through a host of different creative writing exercises participants at this workshop will get an opportunity to self reflect, gain some insights into their thoughts and feelings, and possibly find a new perspective or a better way to deal with life’s challenges. In addition, through meditation sessions, mindfulness and visualization exercises we will try out ways to calm the mind. For those so inclined, refreshing walks and hikes through the forests or mountain/star gazing in clear skies may also provide a greater sense of wellbeing. The program is open to all individuals over the age of 18. Writing experience or expertise is not required. The instructions will be in English but you can choose to write in any language. A public sharing or publishing goal is also not required. To keep the experience personal, we accept only the first 10 applicants. Participants love this workshop. They say nice things. To watch videos of participants, click here or scroll down. 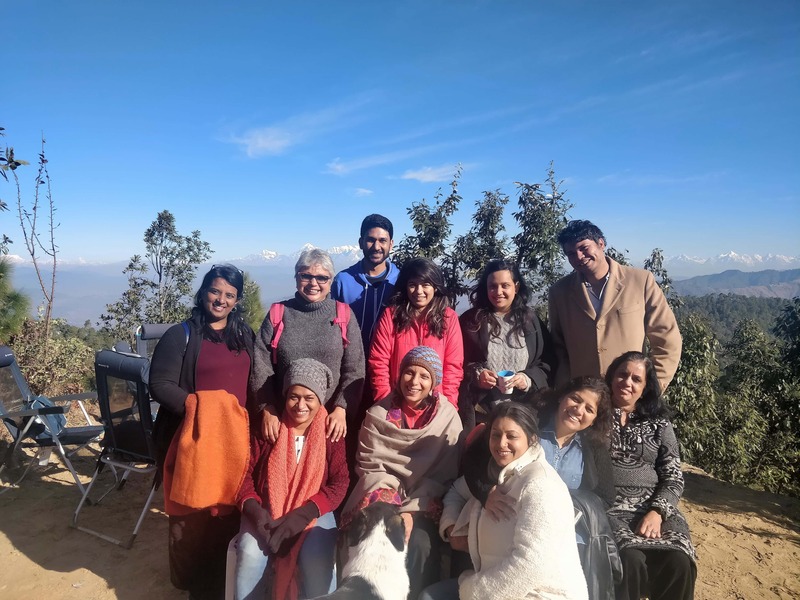 To read participant reviews of the Himalayan Writing Retreat, click here. Facilitator : Dr Vandita Dubey. Dr Dubey is a US licensed Psychologist and a published author. She holds a Doctoral Degree in Clinical Psychology from the Illinois School of Professional Psychology. Her book "Parenting in the age of Sexposure" was published by Rupa in 2016. You can learn more about her and read her more recent blogs at http://vanditadubey.com/ . For a detailed, day-wise program, scroll down or click here. How much : INR 24,900 which covers 3 days, 4 nights of learning, twin-sharing stay, food and taxes). No hidden costs. How to attend : Click on the "Sign up" link below. You can fill out the registration form and pay the 50% of the workshop fee there. You can pay the balance up to two weeks before the workshop. Email us your questions at chetan@himalayanwritingretreat.com . Only ten participants accepted on a first-come first-serve basis. Previous participants from the Writing for self workshop. This workshop is an opportunity to self reflect and express one’s inner most thoughts and feelings. Sometimes we will do this directly, sometimes indirectly through the process of creative writing. Writing is a safe process of self exploration and expression. The exercises have been carefully chosen to provide participants an opportunity to explore different kinds of issues. As the objective of this workshop is self growth, we will not be focusing on editing, reviewing or publishing. However, a short session on these aspects can be arranged for those wishing to know about these areas. Pre-work : You will be writing for yourself. Hence, you do not have to share any writing samples. However, do share your personal objectives or goals for attending this workshop. Also, please plan to bring a small object or talisman with you - anything that you can carry and which holds some importance for you. It can be any object that is dear to you. It could be a piece of clothing, jewellery, stone, photograph - anything. Arrive. Walk. Relax. Chat. Soak in the fire. Those who reach in the morning can enjoy a walk through the forest. Or, visit the two NGOs in our neighbourhood. Or, you can simply choose to enjoy the silence, unwind and relax. At the evening bonfire, you can get to know the other participants. Forming connections as a group. Forming connections with the self. Working with the past. We begin with a relaxation exercise. Learning to relax our mind by relaxing our body. We will then do an interactive writing exercise that helps us come together as a group. We will also do some exercises to help us focus on why we are here, what we want to achieve. Through different exercises we will explore different aspects of our past. Trace where who we are today came from. What shaped us? In the second half of the day we will do two exercises where we will work with some memories/experiences related to our childhood. Meditation. Exploring our present: Uncovering issues. Finding their sources. Increasing acceptance. Discovering strengths. We begin the day with a guided meditation session. Calming the mind has many benefits - psychological and physical. With a calm mind we begin to address what troubles us the most in the present. We will complete an exercise designed to deepen one’s understanding of the issue we pick. Most often our awareness of what upsets us is at a superficial level. Therefore, we address things only at a superficial level. This does not help as the underlying issues are not addressed and various incidents keep upsetting us. We will then do some exercises that help us explore the different facets of our personality. Accept them as part of us. And, most importantly, uncover our strengths. We need to be aware of our strengths as we need to rely on them, especially during difficult times. Working with the internal critic. Letting go of unhelpful emotions. The internal critic often gets in our way. This is not only applicable to creative artistes but people involved in different kinds of activities. It sometimes prevents us from ever starting activities that we may find fulfilling. We will be brave and use all our 5 senses to uncover our internal critic. We will then do an exercise aimed at uncovering it’s origins. Through another exercise we learn to moderate its negative impact on us. We do an exercise aimed at helping us cross the bridges that we need to cross. We do another exercise aimed at putting words to unexpressed emotions. The unexpressed emotions often affect us in negative ways and it is important to express them so that we can let them go. We will end the day with working on our personal mission statement. We will plan for our journey towards continued emotional wellbeing and growth. Any open items not discussed can be covered here. We close the retreat with all participants sharing feedback.